GD Bro Burgers, originally a food truck and a contestant on Food Network’s “The Great Food Truck Race,” opened their second brick and mortar in Long Beach on February 6, 2016! Not only does the red raspberry bun set GD Bro Burger apart from other burger joints, but take a look at what’s INSIDE the Italian Stallion Burger- mozzarella sticks, pepperoni, spinach, pizza sauce, and ranch. The bun has a subtle raspberry flavor that gives a hint of sweetness that compliments the rest of the rich and savory burger. Obviously I had to go with red! If you know me, then you’ll know that Zara is one of my favorite stores! Guess where this romper is from? Yep, Zara! Guess where my flats are from? Yessss, Zara! This romper can be dressed up or down which makes it one of my most worn pieces. I especially love the low cutout back. These flats are perfect for any occasion. They’re formal enough to wear for business, but also trendy and cute enough for a casual day out. 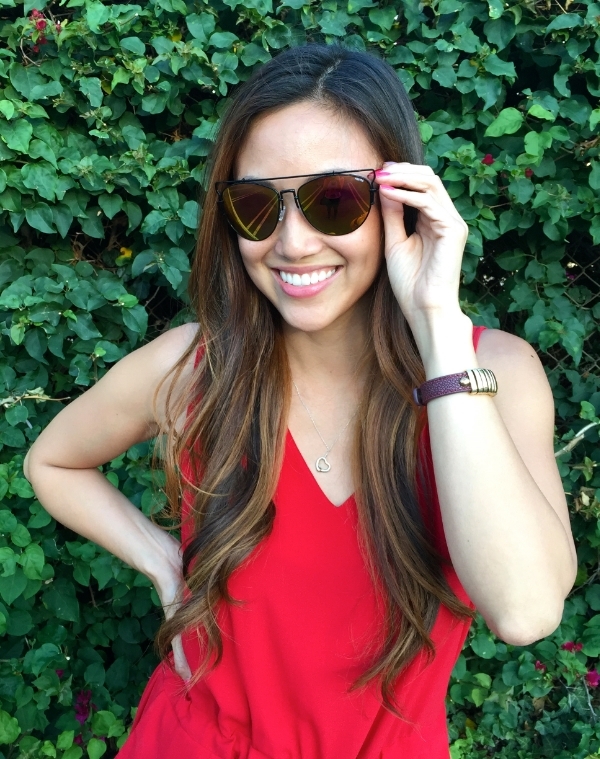 My sunglasses are from Freyrs, which has free shipping in the US! Check them out because I know there’s a style you’d like AND they are super affordable with great frames starting at $9.95. As always, thank you for reading and please feel free to email or contact me with some fun Valentine’s Day stories, your favorite burger spot, or just anything you’d like to share with me! P.S. Stay tuned because I will be launching my new YouTube channel very soon! !